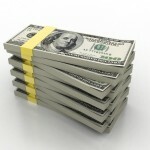 -The Driscolls received an advance of $400,000. -The contract calls for the Driscolls to pay for corrections. I wonder if they did since corrections due to citation errors had to be made. -Mars Hill could have gotten thousands of books through Driscoll at an 80% discount. Instead, Mars Hill’s contract with Result Source called for the church to purchase 11,000 copies at an adjusted retail price so the numbers would count toward the New York Times best seller list. According to this contract, those royalties went to the Driscolls via On Mission. 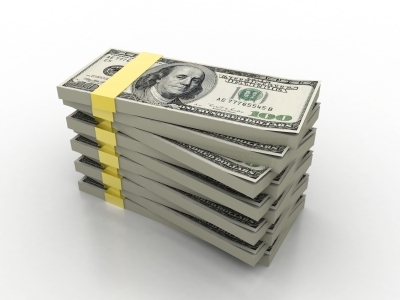 It is hard to escape the conclusion that being the pastor of a church willing to develop a marketing campaign for your book (see that also at WtH) which includes a preaching series (with research done by consultants) and full support from a marketing team (paid for by tithes) is a really sure way to become wealthy. This reminds me of the qualms expressed by the Communications Team at Mars Hill Church in 2011 before the executive elders committed church money to the Real Marriage campaign. 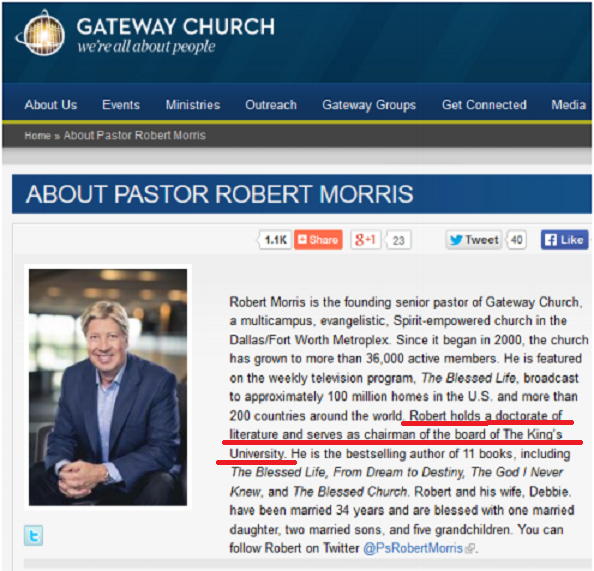 Mark Driscoll isn’t the only one who found financial gain in megachurch service. David Jeremiah does something like this once a year. I wrote the church and Thomas Nelson to ask if this “doctorate of literature” was an earned doctorate. Repeated requests were not answered. 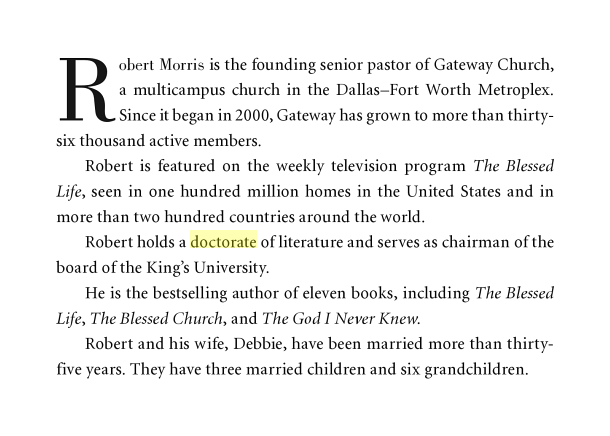 This “doctorate” is most likely to be an honorary doctorate of letters given to Morris by the small Bible school housed in his church — The King’s University. Morris is currently the chair of the board of the school. An earlier 2011 bio described Morris’ doctorate as a “doctor of letters” awarded by TKU. This would have been about a year after TKU’s board awarded it to him. This description of the doctor of letters is closer to the reasons why such honorary degrees are given. However, this bio is still misleading. According to Morris, his main work, The Blessed Life, was ghostwritten. He told his Gateway audience in January of this year that a member of Gateway (David Holland), wrote the book based on on recordings which Morris made in a hotel room. He said the ghostwriter helped him with several books. As it turns out, Morris was given an honorary doctorate for writing books he didn’t actually write. I understand that many celebrities don’t write their own books, but it is misleading to consider those celebrities to be accomplished writers. They may have good ideas and have enough money to afford to pay a good writer but those books aren’t representative of the author’s writing ability when the listed author didn’t write them. 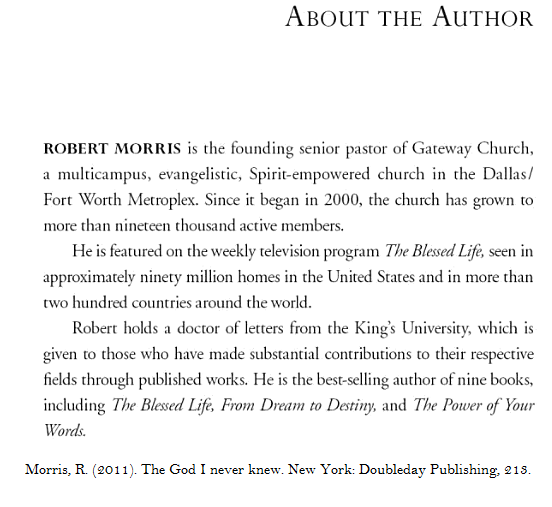 So in his new book published by Thomas Nelson/HarperCollins Christian (as well as the bio on the church website), Morris claims to hold a doctorate of literature when in fact, he was given an honorary doctorate from his own school for books he didn’t write. When it was discovered that Mark Driscoll’s book Real Marriage achieved New York Times best seller status via a marketing scheme, Driscoll stopped using “NYTs best selling author” as a description. That was a commendable move. Of course, the proper thing to do for both publisher and author is to present an accurate description to the public. The ongoing story of Christian authors embellishing their reputations demonstrates the importance Christian leaders place on peripheral persuasion. Perceived expertise is one of several powerful factors operating via the peripheral route to persuasion. Persuasion theory posits two primary routes to persuasion — central and peripheral. In central route strategies, the persuader offers facts and figures with accuracy being important. An assumption is made that the audience is motivated to carefully consider arguments for and against a proposition. However, in peripheral route strategies, the assumption is that the audience isn’t highly invested in the process but will nonetheless make a decision or render an opinion. Peripheral route tactics influence people to say yes or make a decision for reasons other than the merits of the case. In the situation above, the publisher and author have embellished credentials to communicate expertise in the service of selling books. There may be more personal motives but the effect is that audience members who are motivated by perceived expertise will attribute expertise to Morris due to the embellishments. Unfortunately, it appears these kind of tactics are embedded features of evangelical and conservative expressions of Christianity. UPDATE: Just found this article by Phil Cooke on honorary degrees. Bottom line: One should not refer to the degree as if it was earned, or use Dr. in reference to oneself unless one has an earned doctorate. Monday and Tuesday, I wrote about three Christian authors (David Jeremiah, and Les & Leslie Parrott) who have used help from ResultSource CEO Kevin Small to attain their publishing success. 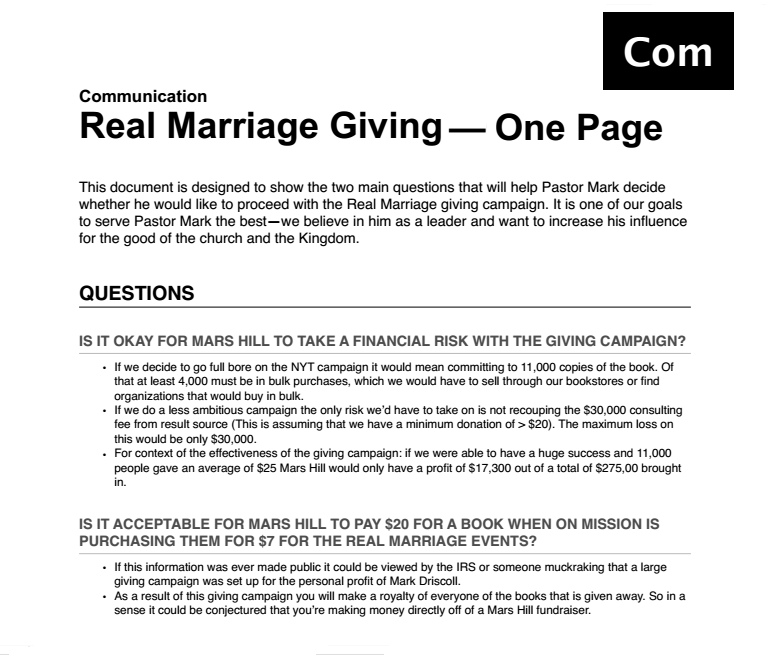 Mars Hill Church’s contract with ResultSource to elevate Mark Driscoll’s book Real Marriage shook public trust in that church. Perry Noble, pastor of New Spring Church, has admitted to using ResultSource to elevate the position of one of his books. There are other authors of books published by Christian publishers who use the ResultSource schemes. Until recently, ResultSource’s methods were wrapped in mystery. However, with the disclosure of the contract between Mars Hill Church and ResultSource, the public got a look at the service purchased by authors who want New York Times Bestseller status. Essentially the author pays ResultSource to purchase a large quantity of books which ResultSource will send to addresses supplied by the author. If the author doesn’t provide enough addresses in the right geographic areas, then ResultSource will supply them. ResultSource deliberately uses methods which overcome obstacles “to the reporting system” (i.e., deceives the bestseller list). See the excerpt from the contract below for the details. I think Taylor cuts to the heart of the problem with manipulation of bestseller lists. The lists should provide a snapshot of the public response to a book. The public at large seems to see the lists as indicating broad public interest and even quality. However, as it stands, what the list provides is unclear. As the extent of manipulation by Christian and non-Christian authors unfolds, the list may be more of a shadowy glimpse into who has sufficient money to purchase their way into a fiction. Taylor calls the manipulation what it is: unethical. Taylor calls the Christian publishing world to a higher standard. The defense that everybody’s doing it is no defense at all. Back in June, David Jeremiah’s non-answer to Marvin Olasky’s question about list manipulation provided an insight into another bogus rationale. Marvin Olasky: TheNew York Times for its bestseller list counts sales from a bunch of secular stores; I understand there’s a company that will go in and buy several books in each of these bookstores. The companies that do that spread the release point of these books that are purchased by individuals so they can get attention. Is that legitimate? David Jeremiah: The bottom line is you’re selling these books and they’re just not getting noticed. If you want the books to be noticed so that you can reach more people with them, you’ve got to figure out how to do that. I don’t know all of the ramifications of it, but I know that you can’t just write a book and say I’m not going to have anything to do with marketing. If you don’t care enough about it to try and figure out how to get it in the hands of other people, nobody else is going to either. If you want your books to be noticed, you have to do something about it. It is stunning that David Jeremiah, a man who provides daily bible advice about a host of topics, can say unchallenged that he doesn’t “know all of the ramifications of it.” Dr. Jeremiah, fellow Cedarville University alum, let me ask you to read Justin Taylor’s statement about the ramifications. Let me hasten to add that I don’t know exactly how Jeremiah worked with ResultSource. However, given the direct question about manipulation of sales asked by Olasky, it is disappointing that Jeremiah did not answer it directly. It disadvantages those actually gifted. See also the comments of the Director of Communications for the New York Times. At the end of the day, it should not be hard for Christian leaders to understand why fooling the public with a purchased persona is wrong. When Mark Driscoll’s deal with ResultSource came to light, the church initially called it an opportunity, then unwise, then wrong. Eventually Driscoll removed the designation of NYTs best selling author from his bio. What should other authors do who have used this scheme? What should publishers do? At Crossway, there doesn’t seem to be any problem with understanding the ramifications. Excerpt from the contract between Mars Hill Church and ResultSource. The entire contract is here. For another inside look at ResultSource in the context of business publishing, see Jeffrey Trachtenberg’s article. We are aware of the issues that have been raised about Mark and Grace Driscoll’s REAL MARRIAGE, and we are working with the authors to address them as efficiently and effectively as possible in all formats. Thomas Nelson has addressed two of the several issues which have been raised here and elsewhere. 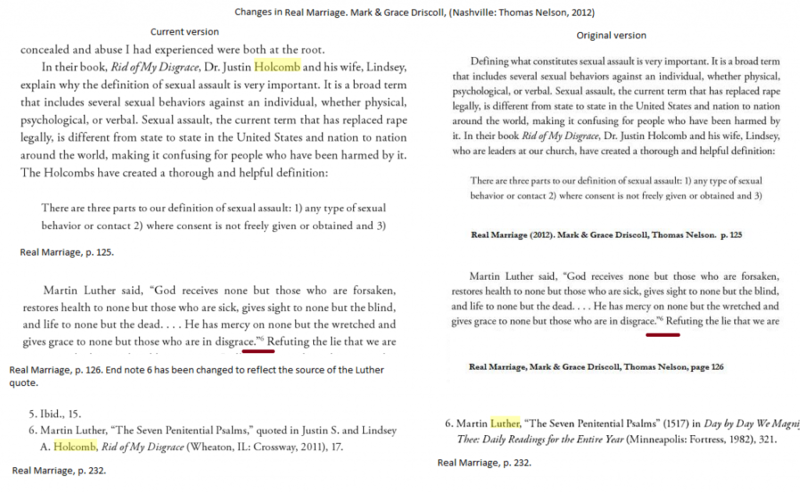 On January 9, I compared a section of Mark & Grace Driscoll’s book Real Marriage to Justin & Lindsey Holcomb’s book Rid of My Disgrace. In that post, I noted that the Driscolls did not give adequate credit to the Holcombs for some material adapted from the Holcombs’ book on recovery from sexual assault. While some supporters of Mark Driscoll have minimized concerns about plagiarism and inadequate citation, the publishers involved apparently consider the problems to be important. First, Thomas Nelson added an acknowledgment to Dan Allender* in Real Marriage and now the publisher has made more changes in the book to more appropriately cite the Holcombs’ work. With these corrections, Thomas Nelson addressed the precise issues that I pointed out in the January 9 post. The current version is much better and gives appropriate credit to the Holcombs. Thomas Nelson should get some credit for this reaction to concerns over plagiarism. In contrast to Tyndale House, Thomas Nelson apparently viewed the citation of the Holcomb’s work as less than market standards. Recall that Thomas Nelson pulled David Barton’s book, The Jefferson Lies when it became clear that the book was filled with factual errors. Now, they have taken a less drastic course but nonetheless tacitly acknowledged problems which require action. I would say that the several publishers involved have a lot more work to do to make appropriate corrections. Now that Thomas Nelson has moved to make these changes, Tyndale House may feel additional pressure to rethink the findings of their investigation regarding citation of Peter Jones’ work in A Call To Resurgence. *This now shows up in the Google version as well. UPDATE: Thomas Nelson issued a statement to me today regarding the changes being made to Real Marriage. Click the link to read the statement.